The Honeywell 3820i delivers fast, intuitive barcode reading across a range of high and low density codes - even those that are damaged or poorly printed. In addition, the solid state technology platform adds to the device's overall durability and reliability. Built for scan-intensive applications requiring a ruggedized solution, the 3820i features our highest drop specification and an IP54 rating to guarantee protection against the penetration of dust and liquid. However, unlike other industrial grade solutions, the 3820i features best-in-class ergonomics - ensuring maximum user comfort and productivity. The 3820i features a unique design that not only allows tool-free access to the battery, but also eliminates the need to dock the scanner for charging - a true advantage for operations where downtime is not an option. 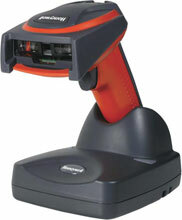 The Honeywell 3820ISR-USBKITAE is also known as HHP-3820ISR-USBKITAE	or 3820ISRUSBKITAE	.